We naught the Bath tour option. 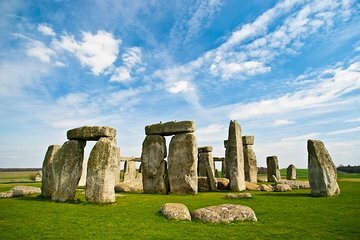 Both Stonehenge and Bath tours were recorded audio tours. Guide on bus was friendly and energetic! That said I would rather have a person talking to me Vs. tape recorded blurbs. The tour guide was very knowledgeable and friendly. I would take another tour with this gentleman. Bus was clean and comfortable. It was a good and relaxing trip. Our bus was very comfortable, bathroom facility and WiFi on board. Stonehenge and Bath were very nice. the reason I didn't give 5 stars because the guide and driver were not as good as I expected. And there was no communication after I booked the tour from Viator. Lots of people show up at the meeting place no clue like us. But overall was very nice trip. Highly recommended. Fantastic experience for myself, my son and grandson 12 yrs old. The tour guide was like having my auntie take us around - so warm and friendly -really loved her! We learned a lot too. GREAT!! Bath is just the perfect place... History, people, food!!! I will go back! - Stonehenge was very interesting. AMAzing tour. Our guide was so good, to avoid the rush at Stonehenge he alongwith the driver decided to drive straight to Bath. Gave us excellent information on Bath and Stonehenge. All in all an excellent tour. Our tour guide was very informative and both sites were amazing. We did the tour of the Roman baths and it was well worth seeing. We wished we had more time in Bath to wander around the shops, but there's only so much time in a day. Everything was as advertised and the tour guide on the bus was especially great! One of the highlights of my trip to London! Our tour guide Emily was amazing, very informative and fun to listen to! Stonehenge was great and we had plenty of time to explore Bath, too, definitely recommend! The timing was very poorly thought out. Honestly, there is just not enough time in Bath to make the visit worthwhile. We did not have time for lunch and arrived to Bath with only 2 hours and 20 minutes. There were huge lines to the Roman Baths and also for Jane Austen. On top, the guide did not provide sufficient guidance on where to eat, how to return to the bus, etc. Would not recommend.